Remember when @sagenorthcutt almost got eaten by a bear? Whether you missed it the first time or just want to relive it again, Sage Northcutt told a story at the beginning of the month that was absolutely incredible. Basically, the kid-tested-mother-approved UFC fighter almost reenacted The Revenant on a hiking trip. Luckily, it was recently animated by Case Harts so we can experience it new and exciting ways. What needs to happen next is obvious. 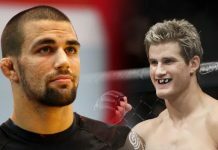 Sage Northcutt needs to partner up with Ilir Latifi to produce a wildlife adventure show. Or you know, just any show. Film anything with Sage Northcutt and put it on air, release to Fight Pass, or make it free on YouTube. These adventures need to not be left to the imagination of fans, regardless of how awesome it is that it got turned into a cartoon. This article first appeared on BJPenn.com on 3/22/2018.